95. What’s your rule of life? There is a rediscovery going on in recent times, where we have come to recognise that over the centuries there have been some very godly men and women who have had a lot of wonderful things to share. This revelation makes us realise that we are missing out on some gold nuggets of truth if we don’t pay attention. 1500 years ago St. Benedict wrote his ‘rule’. Friends of St. Benedict write – Although written for monastics, many of the issues addressed in the Rule can be applied to life in the world outside the monastic community. The qualities which make up a valued life – humility, patience, simplicity, solitude, caring for others, and living in community – concern everyone. These specifics of the Rule, and the framework it provides, have great meaning for people who are seeking to live out their faith in the world today. 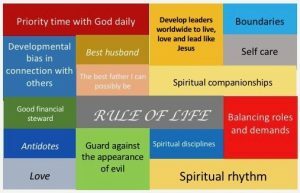 The rule offers people a plan for living a balanced, simple and prayerful life. 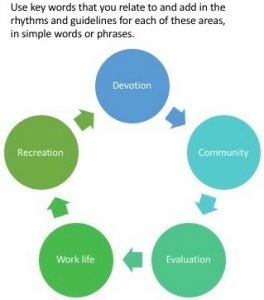 The BenedictineRule revolves around five practices that are a basic guide for living the Christian life: ​Prayer, Work, Study, Hospitality and Renewal. There are many mottos that we quote like – do your best, never give up, never say never – which encourage us to have certain behaviours or to hold certain values for how we live our life. So we can develop our own rule of life that shares the guidelines that we have put in place, to shape the way we live, lead and love God and others. A rule expresses the rhythms of life that fit us and enable us to grow and pursue our life long goal of becoming more like Jesus. A simple rule of life for the early church is stated in Acts 2:42, “All the believers devoted themselves to the apostles’ teaching, and to fellowship, and to sharing in meals (including the Lord’s Supper), and to prayer.” The rule of the early church described distinct practices that were different than the cultural norms. Over the years Christians have developed rules and rhythms for living, that centre their lives in loving Christ rather than the world. Your rule will speak to you uniquely and help you to live your calling out in the best possible way. It is taking into account, your context, your relationships, your work, your gifts, your longings and who you are as a person. It speaks into how you will live your life out in your sphere of interest and influence. The rule isn’t a long list of do’s and don’ts but is more like a trellis with behaviours, disciplines that enable you to grow in the way you desire. Your rule is not a fixed document and so feel free to edit and add to it over time. It may well not all come together in one sitting, but will take time to be pieced together as you dwell thoughtfully on your next phase of life. It is meant to be a statement that will keep you on track, help and encourage you, so if it’s not doing that, scrap it and start again. There are many ways of writing a rule of life – and there is no rule to it! Before making a rule, take time to think about your life as a whole. Think about: your natural rhythms, good habits that you have established, desires and dreams, limits and boundaries, times of closeness with God and those you love. Here are some questions to consider in the preparation of a rule. 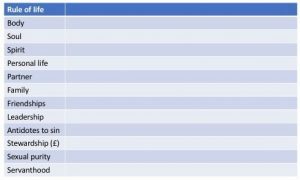 Think of a timespan of at least the next 5 years. What are the main categories in your life right now that are key to live life to the full and require your focus in order to grow? What practices have helped you to draw closer in your relationship with God and what is the longing in your heart? 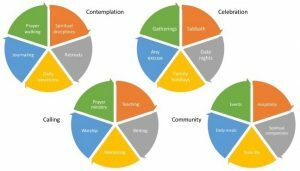 In friendships and family we tend to do different kinds of things on a daily, weekly, monthly, seasonal kind of basis – think about how you can relate to God in different ways in various time periods. What activities in your life bring you a sense of fulfilment, satisfaction or contentment? How do you go about developing, growing and deepening your relationships, ministry and personal life? What customs or habits have you developed over the years that are like train tracks to maintain asense of stability and direction in your life?Apart from my rule of life with points for certain categories at the end of this letter, here are some templates with a variety of ideas for creating a rule of life.Different personalities go about this in different ways – you may need only phrases to remind you of the specific rule in a certain area of your life. Or perhaps you would like a picture to communicate. So choose a template that fits you best or better yet, create your own way of expressing your rule of life. Here is a simple written version of my ‘Rule of Life’ for certain categories. So start simply and add to it over the coming months. 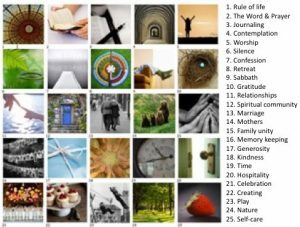 This entry was posted in Self Surrendered Leadership, Spiritual Leadership and tagged balanced, early church, rule of life, values. Bookmark the permalink. ← 94. Where are you going?